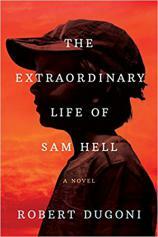 Sam Hill always saw the world through different eyes. Born with red pupils, he was called “Devil Boy” or Sam “Hell” by his classmates; “God’s will” is what his mother called his ocular albinism. Her words were of little comfort, but Sam persevered, buoyed by his mother’s devout faith, his father’s practical wisdom and his two other misfit friends. Forty years later, Sam, a small-town eye doctor, is no longer certain anything was by design --- especially not the tragedy that caused him to turn his back on his friends, his hometown and the life he’d always known. Running from the pain, eyes closed, served little purpose. Now, as he looks back on his life, Sam embarks on a journey that will take him halfway around the world. This time, his eyes are wide open --- bringing into clear view what changed him, defined him and made him so afraid, until he can finally see what truly matters.